The Conservative MP John Bercow has been appointed as Commons Speaker after a six-hour election process. The Buckingham MP beat nine other candidates, including Labour's Margaret Beckett and Tory veteran Ann Widdecombe, to be named 157th Speaker. In the final round he got 322 votes to fellow Tory Sir George Young's 271. Formally declared Speaker after Royal approval, he replaces Michael Martin, who quit after nine years, amid the furore over MPs' expenses. 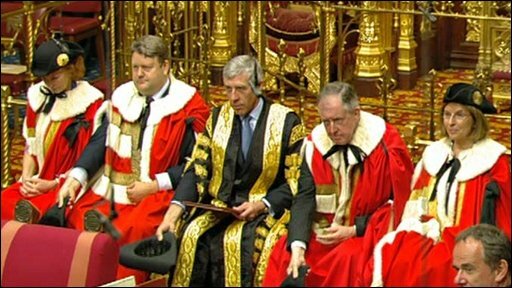 After the result was announced, Mr Bercow was dragged to the chair, a tradition for the new Speaker, congratulated his nine rivals and told MPs it was the "greatest honour" of his political life. He said MPs felt "very sore and very vulnerable" in the wake of the expenses scandal but added "large sections of the public also feel angry and disappointed". "We do have to reform but I just want to say that I continue to believe that the vast majority of members of this House are upright, decent, honourable people who have come into politics, not to feather their nests, but because they have heeded the call of public service," he said. He was welcomed by Prime Minister Gordon Brown, Conservative leader David Cameron and Liberal Democrat leader Nick Clegg, in short speeches in the Commons chamber. However BBC political editor Nick Robinson said many Conservatives were unhappy about the result as Mr Bercow was disliked by many on his own side. A former right winger who has moved towards the centre ground, Mr Bercow angered many in his own party when he agreed to act as an adviser to Gordon Brown on support for children with learning difficulties. There were some laughs as Mr Bercow pledged "permanently to cast aside" his "previous political views". However, some Tory MPs did not clap him. Mr Brown remarked, to laughter: "It is said that you have now cast aside all your past political views - some of us thought you had done that some time ago." He congratulated the new Speaker and said his election meant the House of Commons had taken an important step in the "process of change". "Undoubtedly the road ahead will not be easy. But with your leadership and integrity this House has begun the path to renewal," he said. Mr Cameron told him: "We share a collective responsibility for what went wrong, we share a collective responsibility for putting it right. "Your success will enable all of us to succeed in this, and on that note I wish you well." He also noted that Mr Bercow was the first person of the Jewish faith to hold the office and said it was a milestone which should be marked. And Mr Clegg, who had publicly called for Mr Martin to step down, warned him that "change does not come easily to this place, where old habits die hard". He added: "So you must be different from every Speaker that has ever come before you. No longer just another pillar of the establishment - we urge you to reinvent the role of Speaker as a catalyst for radical change." Martin Salter, the Labour MP who ran Mr Bercow's campaign, said he would be the "clean break candidate" who could reform the "arcane" procedures of the Commons while protecting the rights of backbenchers. He said: "The Speaker can either be a road block to reform or an agent of reform and change and there's no doubt about it that John Bercow will be that agent of change." 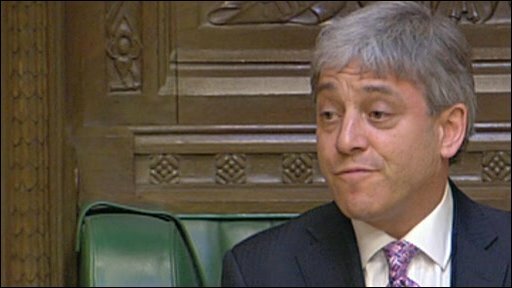 John Bercow is declared Speaker of the House. Mr Bercow and Sir George Young topped the first two rounds of voting with 179 votes and 112 respectively in the first round, 221 to 174 in the second and 322 to 271 in the final round. The new Speaker formally took up the role in an "approbation" ceremony - the process of Royal approval in the Lords chamber. His predecessor Michael Martin became the first Speaker to be forced from office in modern times following widespread public anger at the number of MPs who were seen to take advantage of the Commons' expenses rules. His replacement will inherit the role of adjudicating MPs' debates, representing Parliament to outside bodies, as well as overseeing the administration of the House of Commons. Earlier, Mr Martin formally stepped down as an MP, paving the way for a by-election in his constituency of Glasgow North East. The Treasury announced that he had been appointed Steward and Bailiff of the Manor of Northstead - a procedural device which allows MPs to resign between elections. What are your views on Speaker?